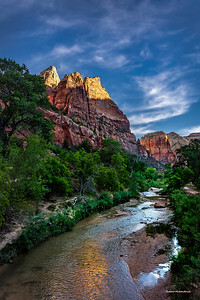 The Virgin River and its tributaries run through Zion National Park. This water is the primary agent of erosion that continues to carve and shape Zion. The North Fork of the Virgin River begins north of Zion at Cascade Falls, where it drains out of Navajo Lake at 9,000 feet above sea level. The East Fork of the Virgin River originates above Long Valley. Both the North and East Forks of the Virgin River run through the park and empty into Lake Mead at about 1000 feet above sea level, where it joins the Colorado River. Though the Virgin River is relatively small, it is incredibly steep. The river drops roughly 7,800 feet in the 160 miles it travels. In the park, the river drops an average of 71 feet every mile. In comparison, the Mississippi River drops about one inch every mile. This steepness, caused by the uplift of the Colorado Plateau, has given the Virgin River the ability to cut through sandstone and carve canyons. The high temperatures, limited rain, and drying winds of the desert can present a harsh environment for wildflowers. 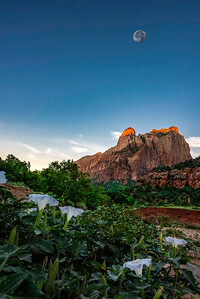 These unforgiving conditions make the abundance of Zion’s wildflowers seem even more spectacular, set against a backdrop of towering sandstone cliffs. Large, delicate flowers like the sacred datura (Datura wrightii) and Bridge’s evening primrose (Oenothera longissima), which wilt in the heat of the day, bloom at night in cooler temperatures. Others, like the datil yucca (Yucca baccata), have flower petals with a waxy coating. A waxy coating, or cuticle, allows the petal to retain water and withstand the drying heat. Still other desert survivors, like elkweed (Swertia radiata), bloom in the high elevation of Zion’s plateaus where the temperatures are cooler and rains are more frequent. Wherever you find them, the wildflowers of Zion National Park give you the feeling you’ve stumbled upon a secret treasure, an extra splash of color in the dry, red rock desert. 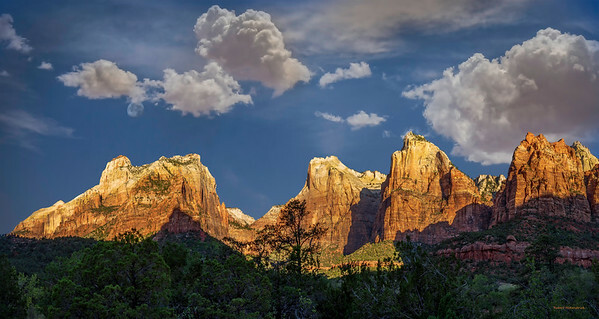 One of the most recognized landmarks in the park, Zion's Court of the Patriarchs reach into the Utah sky. These three photogenic peaks bear the biblical names of Abraham, Isaac, and Jacob. 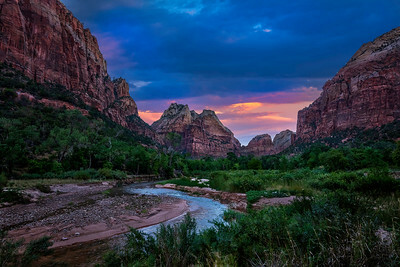 Zion National Park is the most visited park in Utah. The grand beauty of this park is unlimited.